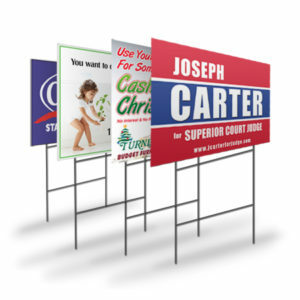 Yard signs have long been a staple of local advertising. You only have to drive around St. Louis neighborhoods like Chesterfield, Clayton, or Glendale to see these signs populating front yards and the sides of busy roads. There’s a reason why yard signs are so popular: when used correctly, they are down-to-earth advertising that can achieve billboard-sized results. While even standard (non-digital) billboards often cost over $1,000 per month, yard signs can achieve the same impressions for a fraction of the cost. Yard signs also circumvent the stigma that often comes with billboard advertising, which many consumers consider to be too lofty. If you’re advertising for a local business, yard signs are effective at conveying a down-to-earth persona that brings your brand closer to your audience. After all, it’s no coincidence that yard signs are a popular choice for many local election campaigns. Yard signs and billboards have one crucial aspect in common: they both need to convey their message to drive-by audiences who will not slow down just to read a message. This means that your signs should be simple, focusing only on the single most important message you want to convey. The fewer words you use the better, and sometimes even a single brand name or logo can be enough. Remember that yard signs are top-of-mind advertising, which means that in most cases, they will not entice your consumers to immediately turn around and visit your business. Instead, yard signs are meant to ingrain your business or cause into consumers’ minds, which will increase recall of your products or services when they actually need them. Of course, keeping it simple does not mean you should keep it boring. Feel free to experiment with colors, fonts, and more. But as you make these experiments, always make sure that your signs are legible, which brings us to the next point. Again, your consumers don’t have the time to decipher an unreadable message. To capture viewers’ attention, stick with clearly contrasting color choices—contrasting not only from each other but also from the colors of the other lawn your signs in the area. Also consider the dominant colors of houses within your neighborhoods when choosing your sign color. 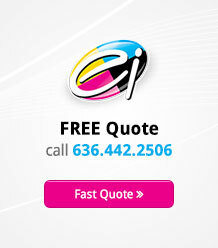 As we’ve mentioned in this space previously, color has a significant impact in getting your audience’s attention. Of course, readability goes beyond your color choices. Text size matters just as much, as the text will become increasingly more difficult to read the faster your audience drives. As a general rule of thumb, your audience will be able to easily read seven-inch-high letters at 25 mph, but you should increase that height to 16 inches if they travel at 55 miles per hour to ensure maximum readability. Finally, carefully consider the type of fonts you use. Simple fonts like Garamond, Helvetica, and Frutiger generally work best. If your yard sign is small, you should also consider writing your message (or at least its focal point) in all-capital letters. One major downfall of billboards is that because of their high costs, many businesses only buy one in a specific location. That means you have to get lucky for it to make an impact: exactly the right audience has to drive by at the right time, and pay attention to the right spot for your billboard to actually reach its effect. Yard signs function similarly when used as singular entities, but because of their low cost, they have a significant advantage: you can spread them out strategically. Using yard signs in multiple locations throughout your local target market greatly increases your chances of gaining your audience’s attention. We don’t propose blanketing your neighborhood in yard signs, but placing multiple signs in strategic, high-traffic areas within your market can go a long way toward helping your business reach the most amounts of people possible. If your market reaches beyond an individual neighborhood, you can take advantage of the low cost of printing yard signs in another manner: adjust the design to match your audience. We don’t propose completely redesigning each sign just to be different; after all, you want to keep the consistent brand message that increases audience recall. But that doesn’t mean you can’t make adjustments. We already mentioned the emphasis on readability above. Chances are that even if you place multiple yard signs within the same neighborhood, they won’t be near streets that all have a unified street limit. Adjusting your signs to keep your traffic in mind by changing the font size and adjusting the message ensures that each yard sign can achieve its maximum effect. We mentioned simplicity and readability as factors of emphasis when using yard signs. But as a bonus, we’ll take it one step further: wherever possible, make strategic use of white space. White space, of course, is the ‘”nothing” space on your sign, where you have neither graphics nor text. As the name suggests, this space can be white, but it may simply be the background color of your yard sign. When used correctly, it can have a major impact on your sign’s effectiveness. Graphic designers have long emphasized the importance of white space, which actually attracts the eye more than many graphics and elicits positive responses from readers. It also increases a sign’s readability factor. The success of your yard signs will depend on attracting your audience’s attention in a blink, and white space is surprisingly effective in achieving just that. Drive down any of St. Louis’s neighborhoods, and you will see yard signs vying for your attention. And there’s a reason for that: their effectiveness far outstrips their cost, making them a popular choice, especially for small businesses and political campaigns. Following the above five tips helps you make sure your yard signs stand out from the crowd and achieve an ROI that a billboard never could.